ViewSwitcher in Android allows you to switch between different Layouts in same Activity. Here in our example we will consider two Layouts and we will display only one which ever is necessary. Let us add textView in first Layout which has the text Internet Connection is Available, when Internet Connection is Available. The other Layout has a textView which has the text Internet Connection is Unavailable. The Layout begins with View Switcher and two different Layouts inside it. How to switch between Layouts. 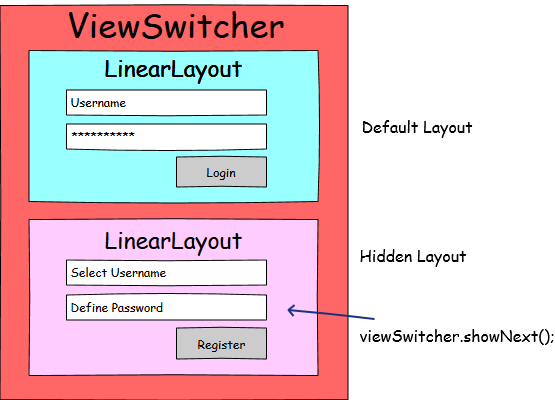 showNext and showPrevious can help you switch between Layouts. How can we use it in the Program. In my example i have a method isOnline which returns true when the Internet connection is Available and returns false when the Internet connection is Unavailable. Using this we will show first Layout when isOnline returns true and display second Layout when isOnline returns false.